Milford, 60 vs. Hopedale, 46 – Final – After allowing 20 points in the first quarter, Milford limited Hopedale to just 26 points over the next three quarters, including just five points in the second frame. Senior Andrew Fraioli had a career night, dropping 25 points while hauling in 15 boards, both career-highs. Senior Kayden Kelley added 12 points and 14 rebounds and junior Brendan White added 14 points. Attleboro, 2 @ North Attleboro, 6 – Final – North Attleboro built a 2-0 lead in the first period, tacked on three more goals in the second period and finished the third with one more goal to beat Attleboro. Big Bue scored both of its goals in the second period, trailing 5-2 heading into the third. Jason McNeany netted a hat trick to led Big Red while Will Yeomans, Brendan McHugh and freshman Tyler Sarro (first career tally) all scored once. Eddie Noel and Jake Parker scored for Attleboro with Ryan Morry and Cam Littig recording assists. Stoughton, 1 @ Canton, 8 – Final – Eight players scored for Canton in the win, including sophomores Chris Lavoie, Timmy Kelleher, Jack Connolly and junior Ryan Colby. Foxboro, 1 @ Norton, 3 – Final – Foxboro junior Brendan Tully scored in the third period but the Warriors fell in a non-league contest against North. Mansfield, 1 @ Franklin, 1 – Final – Click here for a recap of this game. Oliver Ames, 8 @ Taunton, 3 – Final – Oliver Ames exploded for eight goals with junior Brett Williams playing a role in six of them. Williams scored a hat trick and added three assists in the win while Max Ward had two goals and an assist in his first game back from injury. Freshman Ross Carroll added a goal and an assist and junior defenseman Matt McCormick finished with three points. Mansfield/Oliver Ames, 3 @ Westwood, 2 – Final – Foxboro’s Cat Luciano scored a pair of goals in the third period to help the Warriors edge Westwood. Senior Kerran Holmes earned the win in goal. Canton Quad (Canton) – Canton went 2-1 on the day, picking up wins over Lynnfield/North Reading (64-9) and St. John’s Shrewsbury. The Dogs fell to powerhouse Metheun. Duxbury Duals (Foxboro, Mansfield) – The two Hockomock teams in the Duxbury Duals met in the championship, with Foxboro prevailing 39-36 with a win in the final match. Mansfield beat Quincy (24-0) and BC High (38-38, criteria) to advance to the finals. Foxboro beat host Duxbury (59-6) and Andover (54-14) to advance to the finals. Burt Burger Invitational (Franklin) – Franklin finished first at the annual Burt Burger Invitational, racking up 249 points. Jake Carlucci (106) and Jordan Carlucci (126) each won their respective brackets. Jordan Carlucci earned the “Most Pins, Least Time” award with three pins in 5:21. Brian Farrell and Bruce Johnson each had second-place finishes for the Panthers. King Philip Quad (King Philip, Sharon) – Sharon picked up two wins on the day, notching victories over Whitman-Hanson (52-21) and Hock rival King Philip (40-29). Sandwich Invitational (Taunton) – Taunton finished ninth overall out of 17 teams and sophomore Woudanly Danger was named the tournament’s Most Outstanding Wrestler. Danger won the 220 bracket while Mason Frank (285) was second, Alex Simon (195) took third, and Josh Grasso (132) finished fourth for the Tigers. MSTCA Division 4 State Relays – Canton’s 4×200 relay team of Marquise Montes, Cam Sanchez, Cordell Smith and Riley McDonnell came in first at 1:36.37, qualifying for states. Canton’s high jump team of Smith, Montes, and McDonell came in sixth overall at 16-03.25. On the girls’ side, Foxboro’s 4×800 relay team finished sixth at 10:23.48 while the 4×50 shuttle hurdle team was seventh at 32.23. Foxboro, 73 @ Sharon, 46 – Final – Click here for a recap of this game. Taunton, 56 @ Mansfield, 61 – Final – Click here for a recap of this game. Foxboro, 69 @ Sharon, 28 – Final – Freshman Katelyn Mollica scored a game-high 20 points for the Warriors, who also got 15 points from Grace Tamulionis and 14 points from Ashley Sampson. Oliver Ames, 50 @ Franklin, 56 – Final – Oliver Ames senior Kayla Raymond finished with 12 points, five rebounds and five blocks while junior All Scolnick added 11 points and collected three steals for the Tigers. Mansfield, 42 @ Taunton, 36 – Final – Ann Maher scored a game-high 12 points, as the Hornets bounced back from an early deficit to earn the come from behind victory. Taunton jumped out to a 21-3 lead in the second quarter, led 22-14 at half, and 28-26 after three, but the Hornets scored 16 in the fourth for the win. Meg Hill had eight points, 12 rebounds and four blocks for Mansfield, while Lily Patneaude had 11 and Kelsey White had eight for the Tigers. Canton, 5 @ King Philip, 3 – Final – Click here for a photo gallery from this game. North Attleboro, 2 @ Mansfield, 3 – Final – Click here for a Recap and Photo Gallery from this game. Mansfield/Oliver Ames, 1 @ Canton, 3 – Final – Canton’s Lauren Fitzpatrick scored a pair of goals and assisted on another to help the Bulldogs pick up a key division win over visiting MOA. Franklin, 7 @ Stoughton, 0 – Final – Regan Paterson led the way for the Panthers with a pair of goals and freshman Gabby Colace picked up the shutout in goal. Jillian McLaughlin, Maddie Hinckley, Jordan Dwyer, Katelyn Brown, and Victoria Quinn also scored goals for Franklin. Peckham Tournament (Canton, King Philip, Mansfield, Sharon) – Mansfield took first place at the annual Peckham Tournament hosted at Canton High School. The Hornets scored 193.5 points as a team while King Philip placed third with 137 points. Sharon (106.5) was sixth and Canton (98) took seventh. The Hornets had four individual winners with Antonios Sevastos (113), George Glaropoulos (152), Jayden Curley (160) and Vinnie Holmes (182) all taking first. Ciaran Connolly (145), CJ Glaropoulos (138) and Will Stratton (132) added second-place finishes for the Hornets. For King Philip, Jackson Kelley (126), Joseph Fruci (145) and Luke Fitch (170) all won their brackets while Jake Malatesta (160) and Shawn Conniff (182) garnered second place honors. Canton’s Eddie Marinilli (138) and Anis Chakir (132) rounded out the winners for the Hockomock teams. Sharon had eight grapplers finish inside the top four, led by third-place finishes from Justin Wells (285) and Will Stern (120). Chelmsford Tournament (Foxboro) – Foxboro placed fifth overall as a team, finishing with 138 points. Host Chelmsford won the tournament with 204.5 points, followed by Nobles (165), Westford (162.5) and Framingham (156). Phil Dure (126) was the lone individual champion for the Warriors while Adam Lanctot (113) took third place and Dave Dow (160) earned a fourth-place finish. Natick Duals (Franklin) – Franklin cruised through the Natick Duals tournament, winning all five of its matches, including the final round against the hosts. The Panthers beat Concord-Carlisle (73-6), Merrimack (62-12), Brookline (47-13), Hopkinton (72-9) and Natick (69-3) to earn the crown. Jake Carlucci, Kenny Sauer, Ian Bakalars, TJ Remillard, Brian Farrell, Seamus Cogavin, and Riley Downing all went undefeated on the day for Franklin. North Attleboro Quad (North Attleboro) – North Attleboro picked up four convincing victories at its own super quad and had five wrestlers go 4-0 on the day. Big Red notched wins over Bridgewater-Raynham (57-9), St. John’s Prep (54-17), Plymouth State (42-21) and LaSalle (48-25). Ethan Smith (106, three pins), Jake Direnzo (126, two pins), Adam Eberle (160, three pins), Chris Ferrigno (182, one pin) and Brad White (195, two wins) all had four wins for the Rocketeers. Oliver Ames Quad (Oliver Ames, Hingham, Sandwich, Shepherd Hill) – Oliver Ames grabbed two wins at its own quad meet to improve to 11-2 overall. The Tigers earned wins over Sandwich (58-4) and Shepherd Hill (55-0) but fell to Hingham (38-30). Both Dean Pacini and Anthony Berksza went 3-0 on the day with a pair of pins. Canton, 71 vs. Boston Latin, 56 – Final – Canton’s offense poured in 25 points in the first quarter, building a 15-point lead and never looking back against visiting Boston Latin. Senior Tony Harris scored a team-high 17 points and hauled in nine rebounds, setting a new program record for career rebounds. Senior Jake Verille added 14 points, junior Devin Foster had 13 points and senior Austin Maffie added 11 points. Foxboro, 49 vs. Bethel Park, 37 – Final – Holding a two-point lead at halftime, Foxboro outscored Bethel Park 14-5 in the third quarter to create the necessary separation to get the win. Sophomore Brandon Borde scored nine of his 14 points in the crucial third quarter while senior Joe Morrison had five of his team-high 15 points. Bobby Harrison helped seal the win with nine of his 14 points in the final quarter. Foxboro will play Shaler Area High School (PA) in the championship round of its bracket at 12:30 on Friday at Disney. Franklin, 48 vs. Arlington, 46 – Final – Franklin kept Arlington without a final point over the final two minutes and rattled off five straight points to turn a late deficit into a win. Senior Matt Elias (nine points) hit his first three of the game to tie it 46-46 and sophomore Chris Edgehill scored seven of his 14 points in the final quarter, including a pull-up up jumper late to give the Panthers the lead. Senior Paul Mahon (14 points) was named MVP of the tournament while Edgehill and junior Jalen Samuels were named to the all-tournament team. Mansfield, 64 vs. BC High, 73 – Final – BC High outscored Mansfield 17-9 in the third quarter, including an 11-0 run to start the second half. Senior John McCoy scored a team-high 21 points while classmate Justin Vine added 12 points for the Hornets. North Attleboro 53 vs. Reading, 32 – Final – Big Red set the defensive tone early, limiting Reading to just four points in the opening quarter and building a double-digit lead (27-16) by halftime. Junior Josh Montague netted 10 of his team-high 15 points in the first half to help create the lead. Junior Jake Petersen added a career-best 13 points, senior Chad Peterson hit three triples for nine points, and Derek Shanks scored seven points to go along with a strong defensive performance. North will play host Lincoln-Sudbury in the championship of the Warrior Slam on Friday night at 7:00. 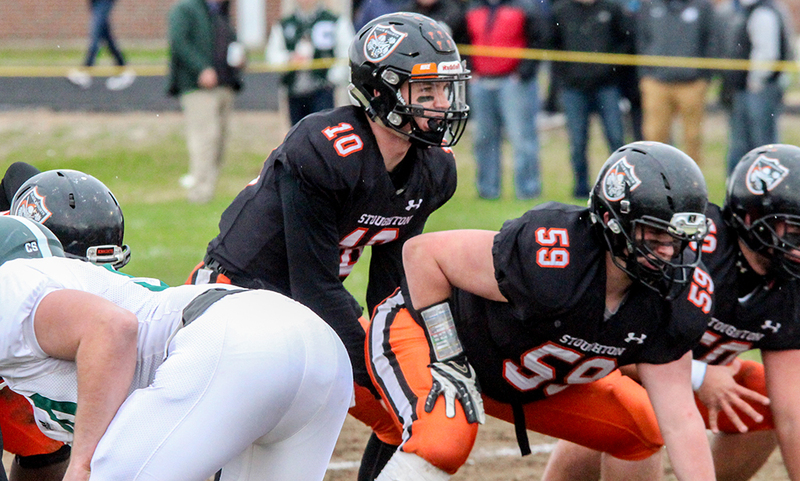 Stoughton, 80 @ Randolph, 60 – Final – Click here for a recap of this game. Taunton, 79 @ Durfee, 70 – Final – Taunton overcame a woeful start (down 12-1) and a 26-point second quarter from Durfee with a strong second half to earn the win in the championship of the Skip Karam Tournament. Junior Lou Vendrell poured in a career-high 26 points, including 14 in the third quarter, to help the Tigers turn the game around. Sophomore Dante Law added a career-high 25 points while senior Lens Esquil, who was named tournament MVP, scored five of his 10 points in the final quarter to help seal the win. Franklin, 40 @ Mansfield, 50 – Final – The Hornets took the lead with a 22-11 second quarter and held on for a double-digit win over their Kelley-Rex rival. Ann Maher finished with a team-high 14 points for Mansfield on four three-pointers. Maggie Danehy added nine points and eight rebounds in the win. Bea Bondhus was Franklin’s top scorer with 14 points and Breanna Atwood added seven. Sharon, 59 @ Holliston, 62 – Final – Emma Eberhardt scored 24 points for the Eagles in the loss. Stoughton, 36 @ Newton North, 40 – Final – Stoughton, which trailed by as much as nine, cut the deficit to just one late in the fourth quarter but Newton North held on for the win. Senior Val Whalen had 17 points and 13 rebounds while sophomore Aliyah Wright chipped in with 13 points. Taunton, 46 vs. Durfee, 57 – Final – Lily Patneaude and Hannah Moniz each scored 14 points in the loss, while Kelsey White added eight points for the Tigers. Attleboro, 3 vs. Weston, 4 – Final – Click here for a recap and a photo gallery from this game. Franklin, 4 vs. LaSalle College, 2 – Final – Luke Downie scored a pair of goals to help the Panthers win their opener of the annual Mount St. Charles tournament. Joey Lizzotte and Zac Falvey also scored for Franklin. Mansfield/Oliver Ames, 3 vs. Ursuline, 0 – Final – Isabelle Shanteler scored a pair of goals and Catherine Luciano added one for the Warriors. Cate Gallagher earned the shutout in goal. 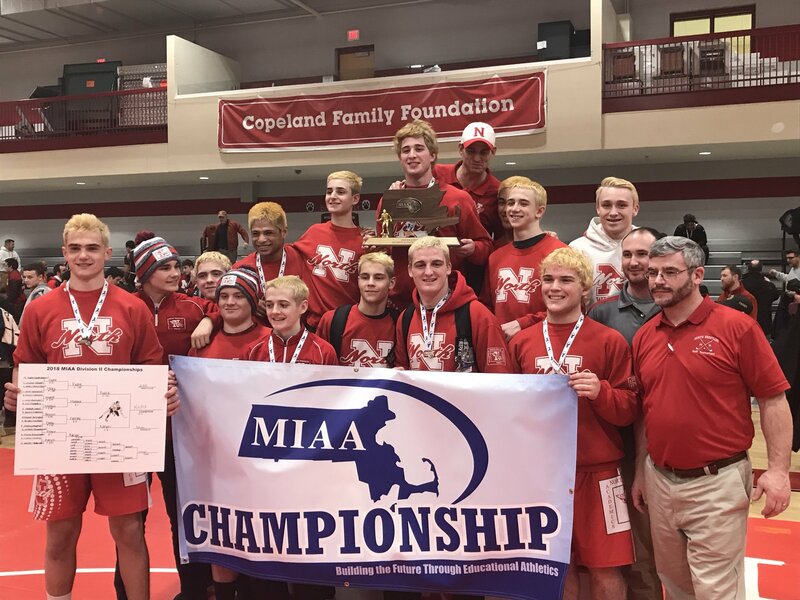 Marshfield Tournament (Mansfield, North Attleboro, Oliver Ames, Sharon) – North Attleboro and Mansfield both had top-five finishes in the team standings while Oliver Ames had its best showing in program history at the tournament. North was fourth with 183 points while Mansfield took fifth overall with 180 points. OA scored 96.5 points, the most in program history at the Marshfield Tournament (now in its 31st year) to take 14th overall while Sharon took 16th with 65.5 points. The Rocketeers had nine grapplers place inside the top seven, led by Danny Cooper (120, 3-1 with one pin) and Jake Direnzo (126, 4-1) who each finished second. John Kummer (285) took third overall, Adam Eberle (160) and Brad White (195) each placed fourth, Ethan Smith (106), Zack Gould (145) and Reid Wills (160) all placed sixth and Mike Burns (132) was seventh in his bracket. Mansfield had a strong day with three individual champions, just one of two schools to accomplish the feat. Antonios Sevastos earned up upset over the top seed, 5-4, to win the 113 bracket, Jayden Curley also took down the top-seed, 4-2, to earn the 160 title and Vinnie Holmes won 8-6 for the 182 championship. CJ Glaropoulos finished third at 138 and George Glaropoulos (152) and Will Stratton (132) each had fourth-place finishes for the Hornets. Oliver Ames’ memorable day was sparked by a second place finish from Dean Pacini (195), who was edged out 4-2 in the final, and junior Anthony Berksza’s fourth-place finish at 145. Freshman Remy Creighton was seventh overall at 106 and Nick McGovern took eighth at 113. For Sharon, Sam Mandelbraut (132) was sixth, Tyler Cashton (152) took seventh and Matt Callan (145) finished eighth. WRENTHAM, Mass. 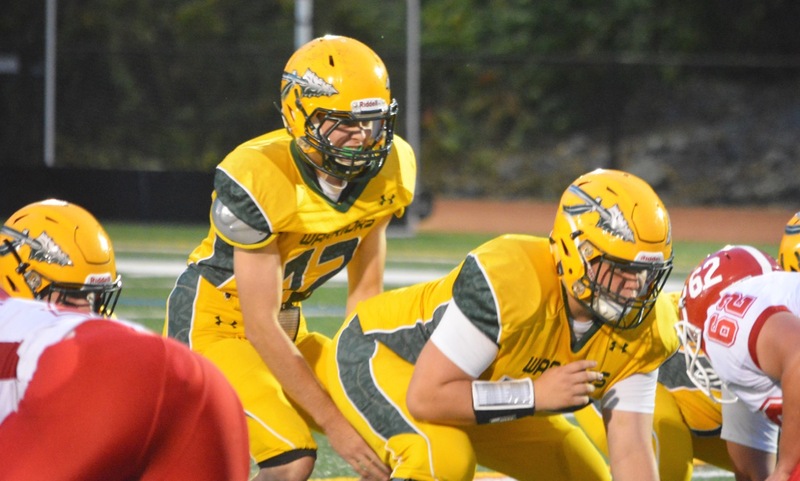 – King Philip came into Friday night’s season opener against fellow league champion North Attleboro at Macktaz Field in a very different position than last season’s matchup. The defending Div. 1A Super Bowl champion Warriors graduated the vast majority of the starters on both sides of the ball, including all but two on offensive, and had a roster filled with new faces. Many of the names may have been new, but the play on the field was the same. KP sacked North’s star quarterback Chad Peterson (13-24, 165 yards) five times, forced four turnovers (two interceptions and two fumbles), and the Warriors made enough plays to pull out a 24-14 victory, the program’s 14th straight win stretching back 2015. From North Attleboro’s perspective, it was mistakes that doomed the Rocketeers on Friday. In addition to the struggles protecting Peterson and the turnovers, North also committed five penalties and just looked out of sync. The struggles started on the opening drive when KP defensive lineman Evan Rice sniffed out a third down screen, tipped, and intercepted Peterson’s pass to give the Warriors the ball at the North 33. A 13-yard run by senior quarterback Brendan Lydon (7-12, 143 yards) got the ball inside the 10, but KP was stopped on three straight plays and settled for a 22-yard Cole Baker field goal. North’s defense made the next big play when Brendan McHugh got to Lydon on a blitz and stripped the ball loose. Brad White recovered the fumble for the Rocketeers and three plays later Peterson hit Nolan Buckley for a 21-yard touchdown into the back corner of the end zone to take North’s only lead of the game. Facing third and 15 on its next possession, KP hit a big play to answer right back. A broken coverage left junior Aidan Bender running free down the seam and Lydon hit him in stride for a 71-yard score. Just two plays into the Rocketeers’ next possession and senior corner Andrew Dittrich forced a McHugh (11 carries, 45 yards) fumble and Dylan Leonard dove on it to get the ball right back. Thomas Madden saved the possession for the Warriors by diving on a fumble on the first play and on third and eight from the North 13, Lydon threw a perfect strike into the corner that was pulled in by David Morganelli for a 17-7 halftime lead. A punt and then back-to-back fumbles gave North the ball at its own 21 about halfway through the third quarter. The Rocketeers put together a 17-play drive that took more than 10 minutes off the clock and needed two fourth down conversions to get themselves back in the contest. Peterson was sacked three times on the drive, twice by Bender, but also went 5-for-7 passing, including a dart on fourth and eight that hit Omar Jasseh and kept the drive alive. One play after the combo just missed on the right side of the end zone, Peterson threw another fourth down strike, this one to senior Marion Bresko down the left sideline for a 27-yard score that cut the lead to just three points (17-14) with 7:54 remaining. A punt gave North the ball right back and a roughing the passer call pushed the Rocketeers to the KP 31. Two plays later, Peterson tried to go for the end zone, but the ball was intercepted by Luke D’Amico at the three-yard-line. On third and nine, facing another punt to give the ball back to the Rocketeers, Lydon fired down the middle to senior tight end JJack Piller, who pulled the pass down despite two Rocketeers in coverage and held on through contact for a crucial first down. With 48 seconds left, senior running back Shane Frommer, who was held to just 41 yard on his first 13 carries, bounced a run off tackle to the left side and was gone for a 57-yard touchdown to seal the win. The personnel may be very different from last season’s experienced squad, but the attitude is the same. The Warriors find a way to grind out victories and make opponents uncomfortable. King Philip (1-0) will try to make it 15 wins in a row when it takes on Foxboro next Friday in the first game at the newly renamed Jack Martinelli Field. Next week, North Attleboro (0-1) will host Bishop Feehan at Community Field.